I know many people had their doubts, but yes, you can travel to Colombia as a vegan! Meat and fish abound on resto menus, but thankfully beans are a common vegan staple which were my savior. Fruits and fruit juices abound, and simple salads are also a common feature. Veggie sides are usually fried plantains, yuca or potatoes. Rice, although white rice, is a plenty. Because I wanted to minimize the fried resto foods, and continue to eat vegan, Rob and I planned for a successful vegan-friendly trip to Colombia. I thought I’d share with you our strategies for vegan eating in Colombia (and no, Rob did not only eat vegan on the trip, too). I brought a few meals and snacks with me to tide me over on the plane and after our arrival. See my new favourite non-traditional hummus recipe, below! I also brought some protein powder as an emergency if I needed a meal replacement, but also to add to whatever breakfast may be. Thankfully I was never without a vegan meal so I just used it with breakfast, as per usual. First, you need to know how to ask for vegan eats which you can find at most restaurants. Happy Cow was also great for locating vegan-friendlier restaurants and health food stores, even if limited in number. Sol del la India was a favourite of ours in Cartagena. I also consulted a few other blogs with vegetarian reviews from Colombian restaurants. Definitely scope out local fruit and vegetable markets as well as grocery stores for other purchases if cooking yourself. The typical Colombian breakfast is coffee/tea/juice, toast, eggs in some form (omelet or scrambled), sometimes an arepa, and fruit. Our B&B in Bogota was kind enough to make oatmeal specifically for me. We ended up cooking our own oatmeal at places that didn’t supply an adequate breakfast. We started off our trip in Bogota and as you know, I was really excited about the cooking class. While we needed a Spanish translator (Juan was a vegan, to boot! ), we were able to cook with a native Bogotan, in her humble abode that even had fruit trees within her courtyard. This was Dona Elsa’s first vegan cooking class and she was receptive to my requests to make a surplus of food for me to take home with me as leftovers. I was excited to try some new-to-me vegetables prepared ala Colombiano. We ended up making the traditional Colombian salad with avocado, a huge amount of vegetable soup (sancocho without chicken, filled with fava beans, green peas, green beans, squash/pumpkin (auyama), green plantains, carrot, corn, spinach and cilantro), frijoles (Colombian beans), yucca frita (fried yucca), patacones (refried plantains), papa fritas (fried criolle potatoes), fresh lulo juice along with a dessert that I forgot to write down. I was antsy about eating the fried foods but they were great. In fact, these were one of the best meals of the entire trip. The patacones and yucca fritas could not be duplicated elsewhere, in ay resto or when I made them myself in a hostel (I went for a non-stick, low-oil option). Sadly, I know the secret: frying in lots of oil. Twice. 😉 Not only was I armed with leftovers, I was now more familiar with the local ingredients and how to prepare them. I don’t know why, but I don’t make hummus on a regular basis. I break it out for parties and when I am travelling. This is currently my favourite non-traditional hummus. It takes a bit more work than your standard hummus, but the results are great. First, you need to saute some shallots (or onion) with rosemary to infuse a small amount of oil for your hummus. Ground pistachios and a touch of tahini are the base for this version that is also spiced with maple syrup and cinnamon. I didn’t think rosemary would pair so well with this, but it was a phenomenal hummus. Sweet, yet savoury. Lighter with the additional water, it isn’t as creamy as a decadent hummus, but you could add more tahini or oil to taste. In short, perfect for me. Enjoy! This is my submission to this month’s My Legume Love Affair, hosted by Susan, to this month’s Herbs on Saturdays and to this week’s Weekend Wellness. 1. In a small saute pan over medium heat, heat the oil. Add the shallots and rosemary sprig (the chopped rosemary will be added later) and saute until translucent. Remove rosemary and set aside to cool. 2. Meanwhile, pulse pistachios in a food processor fitted with its S-blade under very finely chopped. Add the remainder of the ingredients and process until smooth. Add more liquid if necessary. Adjust salt. Serve with your favourite vegetables and even apples! Great tips for travelling- it’s so key to bring backups, have a fridge and embrace local vegan options! This hummus sounds so interesting. I love pistachios! Oh, I’m so glad you finally tried this hummus! It’s seriously one of the best hummuses I’ve ever tasted and must make it again very soon. What a cool hummus idea! I love rosemary, and pistachios are one of my favorites as well. Great travel tips too. After my cooking class in Chile, I will make sure to take one every trip I go on! 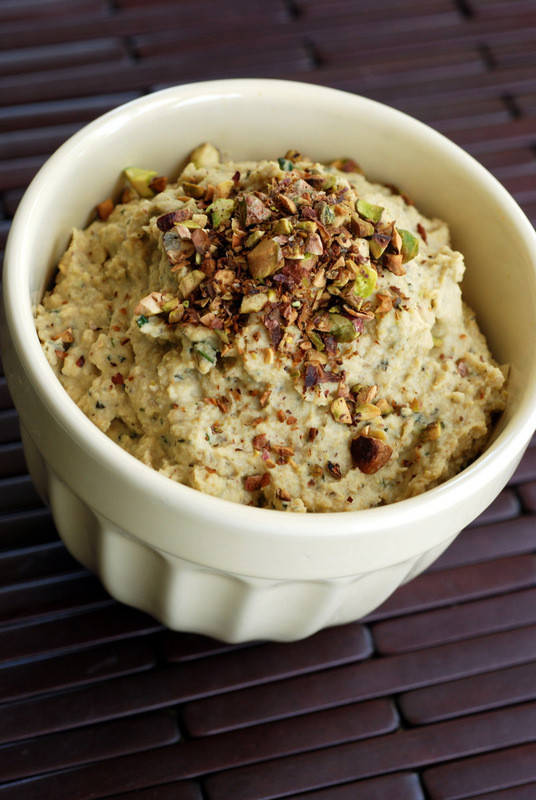 I love the idea of rosemary and pistachios in hummus! It makes me think it would be great with a Moroccan feast. 🙂 Great travel tips as well–even though we aren’t vegan, we do have to find vegetarian food abroad. Making sure you have kitchen access is definitely key! I wish I had planned more for more trip to southern Florida! Who knew it would be just as hard as traveling to south America? Next time…there will be extensive research so I don’t have to eat fried mozzarella constantly. Ugh. I’ll alo come armed with hummus! This sounds so uniquely flavored! This may be the most original Hummus recipe I’ve ever seen. Thanks! So gorgeous to look at and savor, Janet. A really fine, original riff on good old hummus. Thank you for your MLLA contribution! this is delicious! i had no idea weather i’d like it not, so i only used half the amount of rosemary, and 4 tsp agave. it’s still surprisingly sweet though! great, creative recipe. This is such a good elegant hummus recipe! I didn’t expect it to come out so good. It is very warm in flavor, – I love the cinnamon and maple! 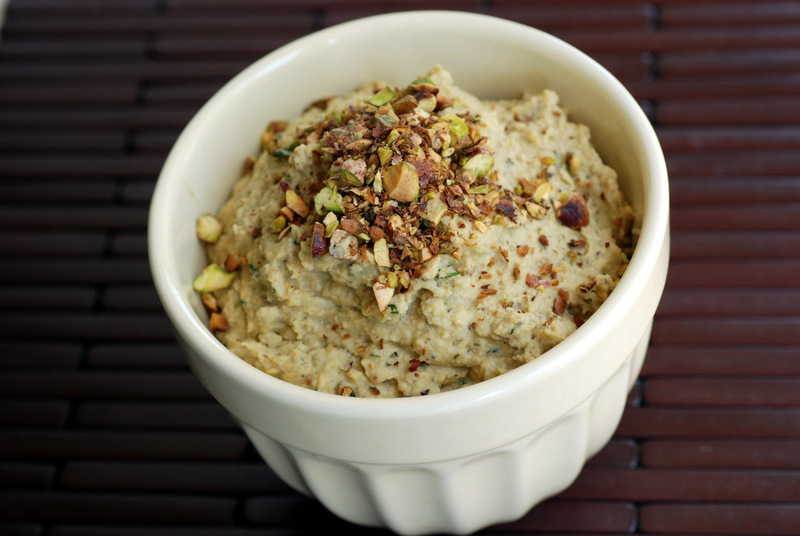 It would make a fabulous holiday hummus dip for Christmas and/or Thanksgiving. I ended up using dried rosemary – about 1.5 tbsp. And 1.5 tsp of white vinegar, as I didn’t have apple cider vinegar. Thanks for the recipe! I’ll certainly try this: I am a pistachio and hummus lover. The photo makes it hard to resist. When I recently saw the link to this recipe in one of your recent posts, I knew I had to make it now that I discovered that I can cook chickpeas and make hummus (it isn’t rocket science! What was I so scared about?). OMG (I’m way too old to say that, but nothing else will do!)! It’s heavenly. And now I have something else to use rosemary in (I love it but don’t have that many recipes that use it). Thanks so much for linking to/mentioning this and tweaking (as you do so well) the original recipe. I agree it doesn’t need parsley and dried chickpeas are preferable to canned. I’m so excited to see this post! I’ve been following your blog for several months now, then randomly saw a linkback to your blog on the Bogota Bike Tours website while researching for an upcoming trip! I just emailed them about availability of tours on the dates when I’ll be in town and really hope it works out!